Last weekend, my wife, daughter and I went to the New Windsor Community Day event which was packed with various food vendors. If I’m in the vicinity of a good looking gyro (pronounced yee-ro), I’ve got to have one. I forgot to note the name of the place selling them, but I think they just do events like this and weren’t representing a restaurant. Anyway, this was a solid pita with meat carved from the spit and dosed with a good deal of tzatziki sauce and got the thumbs up. Even Lu dug the lamb, which was a bit of a surprise. The next day, we went to New Paltz to do some walking around. Before that, though, we stopped at P&G’s because I was jonesing for a beer or two with my meal. I decided on The Mack Truck Burger Melt which was described as, “8 oz. 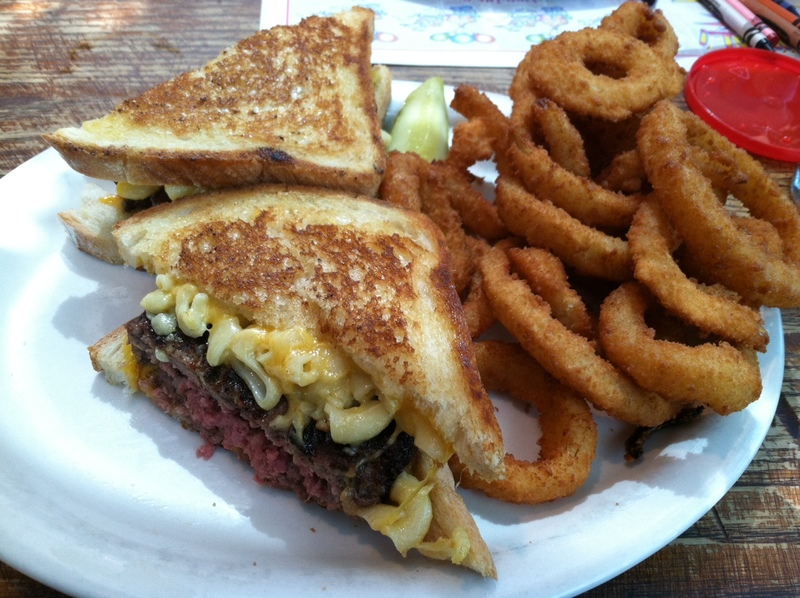 of freshly ground Black Angus beef charbroiled and topped with homemade macaroni and cheese, nestled in a grilled cheese sandwich.” This seemed like a good idea at the time, but didn’t mix well with the press of coffee I’d had that morning, the two beers during lunch and the coffee I had afterwards. Also, I’ve got to say, the sandwich was a tiny bit bland, which I wasn’t expecting. Still, I not only want to try this again, but also want to make one of my own. Finally, the onion rings were killer!